Klayman: Read This NYT Anti-Semitic Trash and See Why the Jewish Left Is the Biggest Threat to Israel and Jewry! WASHINGTON — Representatives Rashida Tlaib of Michigan and Ilhan Omar of Minnesota were hailed as symbols of diversity when they were sworn in last month as the first two Muslim women to serve in Congress, Ms. Tlaib in her mother's hand-embroidered Palestinian thobe, Ms. Omar in a tradition-shattering hijab. Four weeks later, their uncompromising views on Israel have made them perhaps the most embattled new members of the Democratic House majority. 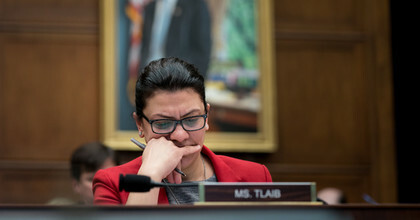 Almost daily, Republicans brashly accuse Ms. Tlaib and Ms. Omar of anti-Semitism and bigotry, hoping to make them the Democrats' version of Representative Steve King as they try to tar the entire Democratic Party with their criticism of the Jewish state.